The Strategic Partnership Leadership (SPL) is a multi-stakeholder advisory group which provides leadership, guidance and oversight for the Strategic Partnership for Health Security. It is comprised of Member States, partners, and donors who review the work of the SPH and regularly assess the progress of IHR implementation in countries. The Strategic Partnership Leadership optimizes Member State’s collective effort for collaboration on the IHR and health security through evidence-informed policies on national strategic approaches for multi-sectoral collaboration and partnership. These contribute to accelerate the progress of IHR (2005) implementation and health security at national, regional and global levels. The G7 supports the WHO Strategic Partnership for International Health Regulations (2005) and Health Security (SPH). At the G7 meeting in Japan in 2016, the G7 countries agreed to use the WHO SPH in tracking the G7’s IHR investments in 76 countries. As part of their commitment to reinforce the global health architecture to strengthen responses to public health emergencies, the G7 committed to “support, undergo, and share such evaluations with our partners, and call on other countries to join in this collective effort, recognizing that partner coordination is key for efficient IHR strengthening, and acknowledging the value of providing necessary information to new initiatives to share information, such as WHO’s Strategic Partnership Portal, while ensuring the information shared among the donors to be comparable and avoiding any fragmentation”. To date, SPH has conducted several high-level meetings which resulted in various actions, guidance, tools, and commitments to improve and manage future global public health risks. The Strategic Partnership for Health Security fosters progress on pandemic influenza planning and civil military collaboration. At December meetings in Hong Kong the WHO Strategic Partnership for IHR and Health Security (SPH) held global consultations on pandemic influenza preparedness and improving collaboration between military and civilian health sectors. The meetings sparked action on both fronts. During the 10-12 December Global Technical Consultation on Strengthening National Health Security through Pandemic Influenza Preparedness Planning, Ethiopia, Indonesia, Kenya and Uganda offered to test the pandemic capacity progress indicator (PCPI) and resource mapping tools developed by SPH to help countries with their pandemic influenza preparedness plans. Fewer than 13 percent of countries have updated their preparedness plan in the past four years. More worryingly, more than a hundred countries have no plan at all. “There are critical tools now available through the WHO SPH and it is important that each country take advantage of those tools so they can prepare their own national plan,” said Dr Rick Bright, deputy assistant secretary for preparedness and response in the U.S. Department of Health and Human Services. More than 110 participants from 44 countries attended the consultation, which is following up on a 2017 meeting in Ghana that brought global health security and influenza networks together for the first time. The influenza meeting was immediately followed in Hong Kong by the 13-14 December Technical Consultation on National Cross-Sectoral Collaboration Between Security and Health Sectors with 51 participants representing Member States, partners and non-governmental actors. Attendees laid the groundwork for a National Collaboration Framework (NCF) to assist Member States in developing civil-military collaboration for health security. SPH is finalizing the framework based on input from the meeting. Piloting in countries will soon begin, in Indonesia, Thailand, Ghana and Uganda requesting support. Participants in the consultation, which followed a 2017 meeting in Indonesia, said it is critical to ensure long-term civil-military collaboration for preparedness, before an emergency and not just joint action during times of emergency. Despite wide recognition of the importance of coordination among national stakeholders from multiple sectors and disciplines for strengthening and implementing IHR (2005) and health security, coordination remains a challenge for many countries. In this context, WHO convened an expert roundtable in October on developing multisectoral partnership coordination. 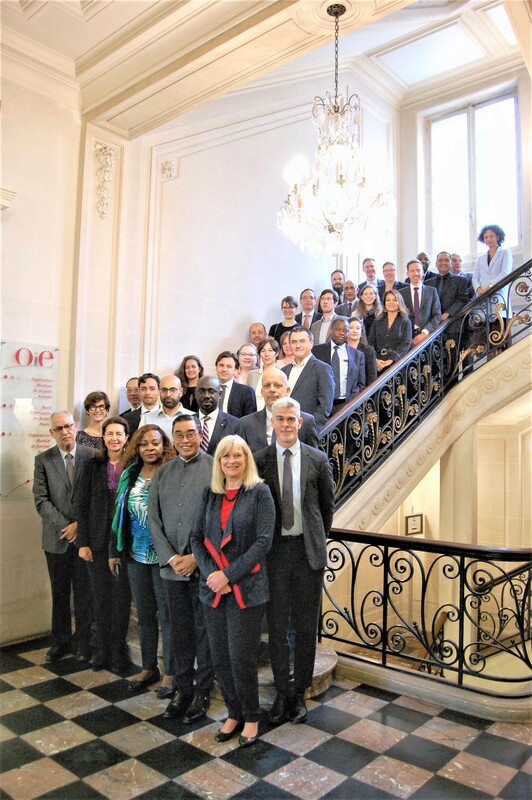 The meeting was hosted by the World Organisation for Animal Health (OIE) from 4th to 5th October in Paris, France. The objective was to identify best practices, case studies and models to coordinate multisectoral partnerships coordination for preparedness and global health security at the national level. Thirty-seven participants from Member States, partners, donors, non-state actors, international organizations and financial institutions reviewed the WHO draft guide for multisectoral partnership coordination for IHR (2005) and health security. Introductory presentations covered topics such as health security financing, the tripartite collaboration of WHO, OIE and FAO, public-private partnerships, the IHR Monitoring and Evaluation Framework and the WHO Strategic Partnership for IHR (2005) and Health Security (SPH). SPH has been working with partners to develop globally-recognized approaches and tools to strengthen multisectoral partnership for public health preparedness. SPH promotes national cross-sectorial coordination, such as between the civilian and military health sectors and through leveraging synergies between influenza pandemic preparedness and health security planning. Multisectoral partnership coordination strengthens country ownership and accountability, supports improved stewardship of resources and fosters organizational effectiveness and sustainability for country health emergency preparedness. Panel discussions at the roundtable concluded that the WHO-OIE-FAO tripartite collaboration should form a key pillar for multisectoral coordination for preparedness and emphasized the necessity to engage all relevant government sectors as well as non-state actors such as academia and business. Working group discussions generated input on key approaches and opportunities for establishing and maintaining multisectoral coordination at the country level. Importantly, the expert roundtable provided specific feedback on the WHO draft guide and proposed a roadmap for implementing the guide. The coordination of national priorities and sustainable financial resources, as well as technical investments from all sectors were highlighted as being critical factors in delivering health security in a fully multisectoral effort. The Stakeholder Consultation on National Health Security and Pandemic Influenza Preparedness Planning was the first time that the global health security and international Influenza networks met and collaborated. It brought together over 100 participants from countries, international, regional and local institutions and organizations, technical partners and donors. The meeting participants reviewed the progress on the International Health Regulations Monitoring and Evaluation Framework (IHR MEF) and national and sub-national planning processes for health security. WHO, OIE and US CDC updated participants on the global strategy on influenza for public health, influenza vaccines, human-animal interface and associated evolving landscape. Participants discussed and provided valuable input to further shape the strategy on influenza including strategic objectives, milestones by 2018 and process to finalize and implement the strategy. They also highlighted the crucial role of global approach of One Health in low-resource setting is crucial and the importance of strategic partnerships to link pandemic influenza and national health security plans, underpinned by One Health, in order to deliver country-specific actions that lead to sustainable and global health security. In 2017, the first global meeting on “Managing Future Global Health Risk by Strengthening Civilian and Military Health Services” was held. The meeting brought together over 160 public health and military representatives from 44 countries, international organizations, partners and donors. In line with G20 commitments to strengthen global health security and accelerate the implementation of the IHR, and as current Chair of the International Committee of Military Medicine (ICMM), the Government of Indonesia convened the meeting with the aim of identifying a shared vision on global, regional and national health security between the two sectors. Two table-top exercises prompted participants to think critically about the nature of their own national collaboration between civilian and military health services in the context of health emergencies. The exercises and discussions underlined the varied nature of military–civilian collaborations. The meeting was organized with the support of WHO. Delivering global health security through sustainable financing - Seoul, Republic of Korea, on 26 and 27 July 2017. The high-level meeting on “Delivering Global Health Security through Sustainable Financing” was convened by WHO and the Government of the Republic of Korea to identify sustainable financing mechanisms and ways to increase and improve efficiency of global and domestic financing for health security. Over 120 participants from countries, parliaments, international and regional organizations and financial institutions reviewed the progress made on the implementation of the IHR MEF and the national planning process for health security, and discussed how countries can elevate global health security on national agendas and attract funding both at national and international levels. The need to engage all sectors in the planning and financing processes and to advocate at the highest level of Government and to Parliament was emphasized. The high-level meeting on Advancing global health security: from commitments to actions brought together 250 participants and observers from 52 countries and 28 organizations. Its goal was to use existing momentum and recent commitments to drive sustained actions for global health security. A number of side events also took place, notably a World Bank Group meeting on sustainable financing for preparedness, a joint external evaluation (JEE) Alliance meeting, and a meeting on zoonoses convened by the Government of Indonesia. Building global health security beyond Ebola - Cape Town, South Africa, from 13 to 15 July 2015. This meeting assembled key national, regional and international stakeholders needed to establish a common framework of action to support, coordinate and intensify the strategic development and maintenance of health security preparedness. It built on the achievements made in Ebola preparedness by all partners, as well as on lessons learned.